Spatial planning requires to integrate environmental, social, cultural and economic factors. The Sustainable Development Atlas is a balanced planning approach. The preparation of the Municipal Development Plan (MDP) has been undertaken as part of the Conservation of Biodiversity and Sustainable Land Use Management (CBSLM) project, which covers the whole of the Municipality of Dragash/Dragaš. 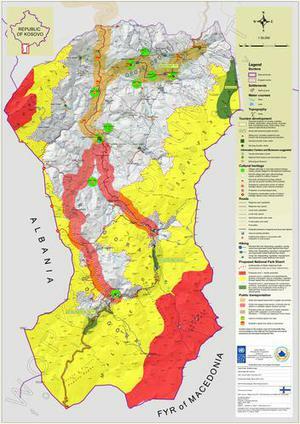 The Sustainable Development Atlas (SDA) for Sharr/Šar National Park, Kosovo, follows the path and method used to produce the Dragash SDA. Here the guidance map for tourist development.